Risotto alla milanese is a rich dish which is often served accompanied by Osso Bucco. It is usually made using bone marrow which can easily be replaced by olive oil. To make a thick, creamy, al dente risotto, it’s important that it should never dry out or drown in too much stock. The amount of stock suggested is approximate; it’s possible that there may be some left once the recipe is completed. It’s also possible that more may be required. If necessary, add boiling water (never cold water). Place saffron in a small glass and pour ¼ cup boiling water on top. Set aside. Pour stock into a casserole and bring to a boil on medium heat. Let simmer slowly while cooking the risotto. Heat a large pot on medium-high with the bone marrow or olive oil, then brown the chopped onion for 2-3 minutes. Incorporate rice, mix well. Pour the saffron infusion and deglaze with white wine. Mix well then add 2 full ladles of hot stock. Salt and pepper, to taste. From now on, cooking the rice will take 22 minutes. Reduce heat to medium and stir every two minutes so that the rice doesn’t stick. Add hot stock regularly, never drowning the rice, but making sure that there is always some boiling liquid in the pot. At the twenty-minute mark, stop adding stock and allow the rice to dry so it becomes creamy. 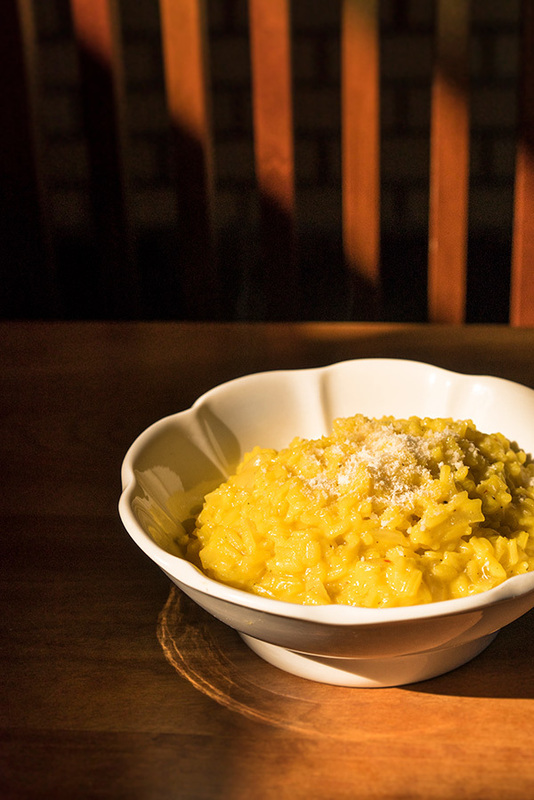 Remove risotto from the heat, incorporate ¾ of the parmesan and the cold butter. If the rice isn’t creamy enough, add a little more broth. Garnish with remaining parmesan and serve immediately.